It’s your Lucky Day! Just in time for Saint Patrick’s Day, this traditional Irish Soda bread is super simple to make and has a buttery flavor and biscuit like texture. Enjoy it with your Corned Beef Dinner or with jam as part of a hearty breakfast. 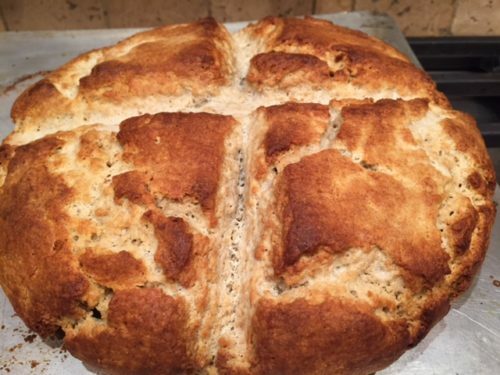 This Irish Soda Bread has a great flavor and a bit of a biscuit texture. Don’t skimp on the butter brushing during baking. It helps create a delicious tasty crust. In a large bowl, blend together flour, sugar, baking soda, baking powder, salt and butter. Stir in 1 cup of buttermilk and egg. Turn dough out onto a lightly oat- floured surface and knead slightly. Form dough into a round and place on prepared baking sheet. In a small bowl, combine the ¼ cup melted butter with ¼ cup buttermilk; liberally brush loaf. Use a sharp knife to cut an 'X' into the top of the loaf. Bake in preheated oven until a toothpick inserted into the center of the loaf comes out clean, 45 to 50 minutes. Check for doneness after 30 minutes. Continue to brush the loaf with the butter mixture while it bakes.